What's the first thing you do as you plan a trip to a new destination? Most people look at a map or consult Google directions. You want to know how to get to the destination, but you'd also like some information about how long the trip will be and where you might stop along the way. There's a reason GPS is so popular -- most people like the security of a map. The same premise is true for EHR implementation processes. Without a map, you don't know where you are, where you're going, or how you'll get there, which can result in increased expense and additional headaches. Working with internal teams and EHR vendors to draw road maps -- also know as workflow maps or process maps -- lets you drive toward EHR success with confidence. What is EHR Workflow Mapping? EHR workflow mapping is the act of documenting the work processes for your practice so you have an instruction manual on which to build future EHR resources. The American Academy of Family Physicians recommends that workflow mapping consider both the flow of patients and the flow of documents in your practice. Accurately documenting your processes lets you see where issues might be hiding, providing you the ability to address those issues with new resources. For example, if your team documents a process that illustrates multiple front-end phone calls between staff and patients, you've identified an inefficiency that could be solved by implementing a Patient Portal for communication. A webinar provided by the U.S. Department of Health and Human Services provides the basic steps for documenting EHR workflow. First, gather a team of experts. Include staff members from all critical areas in your practice as well as at least one vendor representative. Begin by outlining the current work process on a white board or large tablet. Make sure you record everything for review later. Next, define the future state. Future state EHR requirements should be based on information you've already gathered about your practice's needs as well as ongoing input from your staff. Create a list of benefits and operational savings you hope to see from the new EHR system so you can evaluate the success of the implementation later. Workflow mapping is generally considered to be a project management skill. Many vendors offer some assistance with professional process map design, but you don't have to have a trained project manager on staff to illustrate your current patient and document workflows or design a viable future EHR workflow. The National Learning Consortium has published guidelines specific for EHR workflow process mapping.The document includes step-by-step guidelines for drawing process maps, as well as tips specific to EHR implementations, including questions practices should ask when documenting current and future state processes and strategies for reducing waste and errors in any process. 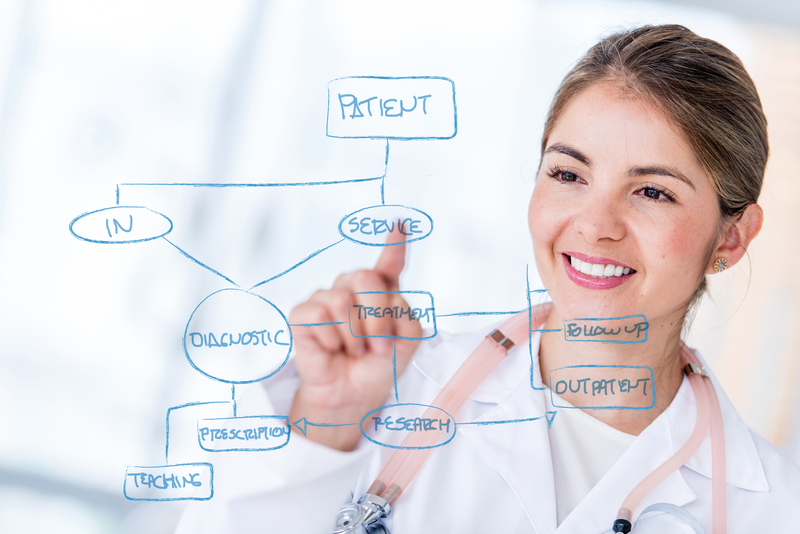 Whether you create an impromptu process map on a spare sheet of computer paper or get technical on a white board or projection display, EHR workflow mapping is an essential step in successful EHR implementation. Even if you are certain you know your practice's workflow like the back of your hand, take the time to conduct a process mapping session with staff. You'll be surprised how small tweaks that occur in workflow overtime change the overall picture. Your staff is responsible for the flow of information and people through your office every day, and there's a good chance they know something about the process that you don't. For help creating future EHR workflows that meet the needs of your business, contact Revenue XL today.